Due to construction in the park, Shuswap Lake Provincial Park will be closed for the season on September 24, 2018. Visitors to the park are welcome prior to this date. This is for the safety of all park visitors and your cooperation during this next phase of campground improvement is appreciated. A very popular destination, the park operates at capacity from early July to Labour Day (early September). The park is situated on the old delta of Scotch Creek, has one kilometre of sandy, pebble beach, and includes the whole of Copper Island. The park also offers a large grassy play area, an adventure playground, a large boat launch, and a self-guiding nature trail. Boaters may wish to visit Copper Island, located 1.3 kilometres offshore. A 2.8 km hiking trail provides beautiful views of the area. Please note that overnight camping, including houseboats, and campfires are prohibited on the island. Supplies, groceries, and many recreational opportunities including bumper boats, mini-golf driving range, go-carts, para-sailing, horseback riding, whitewater rafting, boat and jet-ski rentals are offered by near-by businesses. Trails are located along many roadsides; walkers, please use them. Security – During peak periods, security is on a 24-hour basis. During peak periods, security can be contacted at the Gate Office between 7 am and 10 pm and at the Main Gate from 10 pm to 7 am. Quiet Hours – are 10 pm to 7 am. Music, generators, etc. must be shut off completely between these hours. Disturbances will not be tolerated and those who cause a disturbance may be fined or evicted. Alcohol – It is an offense to possess or consume alcohol in a public place. Valuables – when left unattended or at night, should be stored out of sight and locked up at all times. Please report all thefts to the Park Facility Operator as soon as possible. Forts and Chalk – The building of forts in the wooded areas and using chalk on the roadways are not permitted. Traffic Safety – The speed limit within the park is 20 km/hour. Parking – is prohibited on the side of the road. Please park on the graveled portion of your campsite or in designated parking spaces. Vehicles parked in the day-use area after 11 pm may be towed. Motorcycles – are permitted on park roads only. Motorcycles must be properly licenced and must be operated by a licenced driver only. Helmets must be worn. High Water – depending on late spring or early summer rainfall, there may be limited beach area due to high water levels of the lake. Campsite reservations are required for all campsites in this park during the main camping season. On the north shore of the main arm of Shuswap Lake, and includes Copper Island. Leave Hwy #1 at Squilax, and drive 19 km on paved roads. Note that Copper Island is only accessible by boat. History: Shuswap Lake Provincial Park was established in 1956 and was named for the Shuswap Natives, whose artifacts are found in this area. Canoeing and kayaking are popular on the lake. Please note that lake conditions can change quickly. Pay close attention to changing weather and wind conditions. Large waves can develop quickly. Boat, canoe and jet-ski rentals are available from businesses in the local area. Only specific trails are open to bike use. Ensure all bikes stay on trails. With heavy vehicle use on park roads, ensure youngsters are supervised. Bicycle helmets are mandatory in British Columbia. To protect the park vegetation, cyclists are not permitted on the nature trails, grassy areas, or on the shoulders and banks of park roads. Cyclists are permitted on the park perimeter trail and the beach trail but must give way to pedestrians/hikers. All bike paths are gravel. Shuswap Lake offers excellent recreational fishing opportunities for species such as lake trout and rainbow, bull trout, kokanee, burbot and whitefish. Anyone fishing or angling in British Columbia must have an appropriate licence. Licences and bait can be purchased locally. Refer to the British Columbia Fishing regulations for limits, closers, and restrictions. There are special regulations for Shuswap Lake. There are numerous walking and biking trails – with one self interpretation trail in the park. Copper Island has a 2.8 hiking trail for viewing surrounding areas. Access to Copper Island is by boat only. For your own safety and the preservation of the park, obey posted signs and keep to designated trails. Shortcutting trails destroys plant life and soil structure. Regularly scheduled interpretive programs may be available during July and August. Pets/domestic animals must be on a leash at all times and are not allowed in beach areas, beach trail or park buildings. While the day-use area and beach are off-limits to dogs and other domestic animals, a stretch of beach is available adjacent to the boat launch where visitors may swim with their dogs. Please remember you are responsible for their behaviour and must dispose of their excrement. 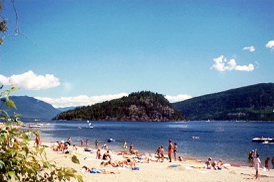 Snorkelling is a popular activity in Shuswap lake. There are no lifeguards on duty at provincial parks. There is 1 km of sand and pebble beach, and a swimming area marked by buoys. Shuswap Lake is very busy. Swimmer’s Itch is present at times. It can best be avoided by toweling off as soon as you leave the water, or by applying baby oil to your skin before you enter the water. In the summer months the water temperature is very inviting for swimmers. Snorkeling is popular. Shuswap lake provides waterskiing opportunities. There are no motor restrictions on this lake. Your boat must have below water exhaust to operate on Shuswap lake. There are windsurfing opportunities in this park. Many of this parks trails are suitable for cross-country skiing and snowshoeing in the winter months. However, the trails are not maintained in the winter months. Parking is available in the boat launch parking lot (weather permitting). A paved double boat launch, no limit to size (vehicle towed) located within the day-use area. Hours are 7:00 am to 9:30 pm; no fee; large parking lot (no overnight storage). During times of low lake water levels, usually September to April, please check the section of boat launch underwater to ensure launching can be completed successfully with your unit. The launch is not steep. Boats are prohibited from staying overnight on the park beach. There is a marina to the parks immediate west and there are several other marinas located around the lake. Water skiing and windsurfing are allowed on the lake. Safe boating procedures should be practiced at all times. Be aware of swimming areas. Get a weather forecast, and be alert to changing weather. Personal watercraft must obey all boating regulations. Firewood can be purchased in the park or you may bring your own wood.Fees for firewood are set locally and may vary. To preserve vegetation and ground cover, please don’t gather firewood from the area around your campsite or elsewhere in the park. Dead wood is an important habitat element for many plants and animals and it adds organic matter to the soil. You can conserve firewood and air quality by keeping your campfire small. Campfire bans may be implemented and some parks may use communal fire rings. Be prepared to bring a portable stove for cooking. Fires are prohibited in the day-use areas. Cold water taps are located throughout the park. Taps are shut off during the off-season. There are hose hook-ups for campers and trailers located at the sani-station. Sites #1-19 and #23-37 offer electrical hookups. An additional service charge of $8.00, per night, applies to these sites regardless of whether electrical service is used. This park has a day-use/picnic area. The day-use area has tables, a change house and flush toilets. This area also offers a grassy play area, an adventure playground, an amphitheatre, a self-guided nature trail and a boat launch. The day use area offers no covered shelters, BBQs, fire pits, or water taps. There are no horseshoe pits. This park has a large sandy beach in the day-use area. The day-use area is open between 7:00 am and 10:00 pm. The gates will be closed and access will be prohibited outside of these hours. Fires are prohibited in the day-use areas. There is an adventure playground and large grassy area in the day-use portion of the park. Adults should supervise younger children. There are no horseshoe pitches in this park. The sani-dump is located is along the entrance road near the service yard. There are hose hook-ups for campers and trailers located at the sani-station. This park offers large vehicle accessible campsites. There are 44 double camping sites. No pull-through sites are available. Almost all sites offer shade at different periods throughout the day. Campsite reservations are accepted and first-come, first-served sites are also available. The campground has a gatehouse that is manned from 7:00 am to 10:00 pm during the peak periods. There are wheelchair accessible toilets and shower facilities as well as a campsite. The main beach trail is wheel chair accessible and there are picnic tables in the day-use areas.